MedCity CONVERGE is a two-day executive summit that gathers innovative thought leaders from across all healthcare sectors to provide actionable insight on where oncology innovation is heading. On July 11-12, 2018 in Philadelphia, MedCity CONVERGE will gather technology disruptors, payers, providers, life science companies, venture capitalists and more to discuss how AI, Big Data and Precision Medicine are changing the game in cancer. See agenda. The conference highlights innovation and best practices across the continuum—from research to technological innovation to transformations of treatment and care delivery, and most importantly, patient empowerment—from some of the country’s most innovative healthcare organizations managing the disease. Meaningful networking opportunities abound, with executives driving the innovation from diverse entities: leading hospital systems, medical device firms, biotech, pharma, emerging technology startups and health IT, as well as the investment community. We are far from machine learning dictating clinical decision making, but AI has important niche applications in oncology. Hear from a panel of innovative startups and established life science players about how machine learning and AI can transform different aspects in healthcare, be it in patient recruitment, data analysis, drug discovery or care delivery. Immunotherapy is revolutionizing oncology care across various types of cancers, but it is also necessary to sort the hype from the reality. In his keynote, Dr. Brody will delve into the history of this new therapy mode and how it has transformed the treatment of lymphoma and other diseases. He will address the hype surrounding it, why so many still don’t respond to the treatment regimen and chart the way forward—one that can lead to more elegant immunotherapy combination paths and better outcomes for patients. In the last few years, biotech and pharma companies have been leveraging digital health tools in everything from oncology trials, medication adherence to patient engagement. What are the lessons learned? Derek Bowen, VP of Business Development & Strategy, Blackfynn, Inc.
Fireside Chat with Michael Pellini, M.D. Dr. Pellini has spent more than 20 years working on the operating side of four companies, each of which has pushed the boundaries of the standard of care. He will describe his most recent experience at Foundation Medicine, at the forefront of precision medicine, and how that experience can be leveraged on the venture side, where he now evaluates new healthcare technologies. CONVERGEnce on Steroids: Why Comcast and Independence Blue Cross? There is a boom underway in cell and gene therapies that are being wielded to tackle cancer and other diseases at the cellular level. FDA has approved a few drugs in the space. These innovations raise important questions about patient access, patient safety, and personalized medicine. Hear from interesting startups and experts about the future of gene therapy. Breakout: What’s A Good Model for Value-Based Care in Oncology? How do you implement a value-based care model in oncology? Medicare has created a bundled payment model in oncology and there are lessons to be learned from that and other programs. Listen to two presentations from experts in the field. A panel of investors interested in therapeutics, diagnostics, digital health and emerging technology will discuss what is hot in cancer investing. Cancer patients are living with an existential threat every day. A panel of patients and experts in oncology care management will discuss what’s needed to make the journey for oncology patients a bit more bearable. Anne Stockwell discusses her mission to help cancer survivors heal their emotional trauma and regain their balance after treatment. A multi-skilled artist as well as a three-time cancer survivor, Anne learned through experience that the emotional impact of cancer often strikes after treatment, isolating a survivor rather than lighting the way forward. Anne realized that her well-trained imagination as an artist was key to her successful reentry after cancer. Now she helps other survivors develop their own creative tools to help them find their way forward with joy. Margaret Foti, PhD, MD (hc), is the chief executive officer of the American Association for Cancer Research (AACR), the oldest cancer research organization in the world. Under her visionary leadership, membership has grown from about 3,000 members to 35,000 in 101 countries and the AACR’s portfolio of peer-reviewed scientific journals has increased from one to eight. Koppenol WH, Bounds PL, Dang CV: Otto Warburg’s contributions to current concepts of cancer metabolism. Nature Reviews Cancer 11 (5): 325-337,2011. Dang CV, Hamaker M, Sun P, Le A, Gao P: Therapeutic targeting of cancer cell metabolism Journal of Molecular Medicine 89 (3): 205-212,2011. Seltzer MJ, Bennett BD, Joshi AD, Gao P, Thomas AG, Ferraris DV, Tsukamoto T, Rojas C, Slusher BS, Rabinowitz JD, Dang CV, Riggins GJ: Inhibition of Glutaminase Preferentially Slows Growth of Glioma Cells with Mutant IDH1. Cancer Research 70 (22): 8981-8987,2010. Wang, JB, Erickson, JW, Fuji, R, Ramachandran, S, Gao, P, Dinavahi, R, Wilson, KF, Ambrosio, ALB, Dias, SMG, Dang, CV, Cerione, RA: Targeting Mitochondrial Glutaminase Activity Inhibits Oncogenic Transformation (vol 18, pg 207, 2010) Cancer Cell 18 (4): 397,2010. Otto AE, Hurd TW, Airik R, Chaki M, Zhou W, Stoetzel C, Patil SB, Levy S, Ghosh A K, Murga-Zamalloa CA, van Reeuwijk J, Letteboer SJF, Sang L, Giles RH, Liu Q, Coene KLM, Estrada-CuzcanA, Collin RWJ, McLaughlin HM, Held S, Kasanuki JM, Ramaswami G, Conte J, Lopez I, Washburn J, MacDonald J, Hu J, Yamashita Y, Maher ER, Guay-Woodford L, Neumann HPH, Obermüller N, Koenekoop RK, Bergmann C, Bei X, Lewis RA, Katsanis N, Lopes V, Williams DS, Lyons RH, Dang CV, Brito DA, Zhang X, Dias MB, Nürnberg G, Nürnberg P: Candidate exome capture identifies mutation of SDCCAG8 as the cause of a retinal-renal ciliopathy. Nature Genetics 42 (10): 840-50,2010. Dang CV: Glutaminolysis Supplying carbon or nitrogen or both for cancer cells? Cell Cycle 9 (19): 3884-3886,2010. Wang JB, Erickson JW, Fuji R, Ramachandran S, Gao P, Dinavahi R, Wilson KF, Ambrosio ALB, Dias SMG, Dang CV, Cerione RA: Targeting Mitochondrial Glutaminase Activity Inhibits Oncogenic Transformation. Cancer Cell 18 (3): 207-219,2010. Koh, CM, Bierberich CJ, Dang CV, Nelson WG, Yegnaubramanian S, De Marzo A: Myc and prostate cancer. Genes & Cancer 1 (6): 617-628,2010. Fan J, Zeller K, Chen YC, Watkins T, Barnes KC, Becker KG, Dang CV, Cheadle C: Time-Dependent c-Myc Transactomes Mapped by Array-Based Nuclear Run-On Reveal Transcriptional Modules in Human B Cells. Plos One 5 (3): e9691,2010. Dang CV: p32 (C1QBP) and Cancer Cell Metabolism: Is the Warburg Effect a Lot of Hot Air? Molecular And Cellular Biology 30 (6): 1300-1302,2010. 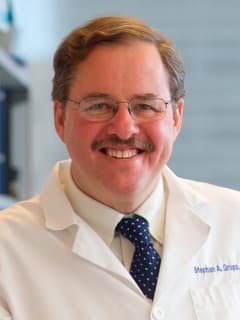 Stephan A. Grupp, MD, PhD, is director of the Cancer Immunotherapy Frontier Program, director of Translational Research for the Center for Childhood Cancer Research at CHOP and medical director of the Stem Cell Laboratory. Working with our colleagues at the University of Pennsylvania, we have recently opened a phase I clinical trial called CART19. We’re using genetically modified T cells in this trial to treat patients with B cell cancers such as ALL, B cell non-Hodgkin lymphoma (NHL), the adult disease chronic lymphocytic leukemia and other B cell malignancies. T cells have the potential to kill cancer cells, but in patients with cancer, they’re not doing their job. By modifying them we can make the cells behave differently so they’ll attack cancer cells, using an engineered targeting protein called a chimeric antigen receptor (CAR). Initial results show that this could be an effective therapy for patients with B cell cancers. Indeed, our initial results show some of the most powerful activity against cancer of any clinical trial testing engineered cell therapy to date. This has received international attention, and some of this work has been published recently in Science Translational Medicine and the New England Journal of Medicine. Prostate cancer is the most commonly diagnosed malignancy in the Unites States and the second leading cause of cancer death in men. Early prostate cancers require androgen to survive and proliferate; this dependence is exploited in treatment for disseminated disease. Wherein androgen ablation in the first line of therapeutic intervention. Although these regimens are initially effective, tumors ultimately recur due to reactivation of androgen receptor (AR) signaling, causing treatment failure and patient morbidity. By studying disease modifier genes we seek to develop new principles to treat cancer, diabetes, autoimmune disorders and cardiovascular disease. Currently most biomedical research focuses on understanding disease pathways. We seek to understand general disease modifier pathways that determine disease severity, an understudied area from which many useful drugs such as NSAIDs and statins are based. A major thrust of our present work focuses on modifiers of inflammatory processes which contribute significantly to the severity of many age-associated diseases. In our main project, we have developed a new class of drugs that recruit the immune system to eradicate a broad spectrum of advanced cancers, including breast, lung, skin, and pancreas tumors that are often refractory to chemotherapy. These drugs, called IDO inhibitors, are presently in Phase II clinical trials. In other projects, with our Lankenau colleagues we are developing new agents to treat autoimmune disorders, reduce risks of cardiovascular disease, and ameliorate diabetes. Our laboratory is interested primarily in cancer genes, cancer immunology and molecular therapeutics. We use transgenic mouse models and preclinical drug strategies to learn new ways to suppress cancer, focusing on long-term goals of improving strategies for cancer prognosis and treatment. Localized tumors are often curable if they are detected before progression to invasive status, but many patients diagnosed with cancer already have invasive disease. What factors dictate malignant progression and how might they be therapeutically exploited? Molecular therapeutics that target key oncogene and tumor suppressor pathways show some clinical promise, but they have shown limited efficacy to date. Cancer modifier pathways that influence the immune microenvironment of tumor cells may strongly influence clinical course. Accordingly, new therapies we are developing are based on blocking enzymes that limit the ability of immune cells to destroy cancer cells or drive disease. RhoB studies derive from our long-standing research on this member of the Ras/Rho superfamily in cancer cell signaling. Recent work in collaboration with Drs. Lisa Laury-Kleintop and Laura Mandik-Nayak at Lankenau has opened exciting new directions in studies of the role of RhoB in autoimmune and cardiovascular disease. A start-up company has been created to fund and advance the preclinical and clinical work needed to explore a provocative new therapy emerging from these novel directions, which in principle may be useful to treat one or more diseases in important areas of medicine. Bin1 studies originating in cancer cell studies led us to discover that it regulates the immune modulatory enzyme indoleamine 2,3-dioxygenase (IDO). Bin1 modifies inflammation in a variety of settings including cancer. Recently, in preclinical studies we found that its genetic blockade can limit the development of inflammatory bowel disease (colitis). Based on this finding, we are now investigating the use of Bin1 antibodies we have developed to treat this disorder. IDO is a tryptophan catabolic enzyme that blocks T cell activation in physiological settings such as pregnancy and in many pathophysiological settings like cancer. IDO is very widely activated as a mechanism of immune escape by cancer cells. Genetic studies reveal that IDO is essential for inflammation-driven cancers, not only supporting immune escape but also angiogenesis and metastasis. We pioneered preclinical studies of IDO inhibitory drugs that can arrest tumor growth and enhance chemotherapeutic efficacy. Mechanistic studies of one clinical lead inhibitor, D-1MT (indoximod), will greatly assist ongoing Phase II studies of this drug. Translational studies including on an IDO-related gene called IDO2 discovered at Lankenau are currently a major focus of the laboratory. A Town Hall Forum will discuss the latest findings with regard to precision medicine, its impact currently in cancer treatment, and future directions, discussed by some of the preeminent cancer researchers and oncologists in the country. This unprecedented event is being hosted by the American Association for Cancer Research (AACR) and Philadelphia Media Network – publisher of The Philadelphia Inquirer, Daily News, and Philly.com. Given the following speakers, this event will have a large focus on use of cancer immunotherapy as well as new targets in the precision medicine arena. Register today: Philly.com/CancerEvent – Use the promo code “AACR” for discounted $45 tickets. When: Thursday, January 21, 2016 • Program: 2 pm • Networking reception: 5:30 pm. Where: The College of Physicians of Philadelphia • 19 South 22nd Street, Philadelphia, Pa. The event will be held in Philadelphia at the College of Physicians of Philadelphia, home of the famous Mutter Museum. 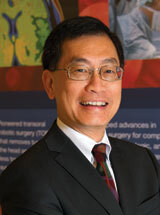 Penn’s Center for Personalized Diagnostics (CPD), which recently named Kojo S.J. Elenitoba-Johnson, MD, as its founding director, is diving deeper into cancer patients’ tumors with next generation DNA sequencing. The genetic tests help refine diagnoses with greater precision than standard imaging tests and blood work by spotting known mutations that can inform the treatment plan. Since it launched in February 2013, the CPD has performed more than 4,000 advanced diagnostics, representing a wide range of cancers. It’s also producing actionable findings: Of those tests, 75 percent found disease-associated mutations, revealing possible new treatment pathways. This new CPD video helps breakdown how the process works, but a patient story can really help connect the dots. We’ve written about several people who benefited from the CPD, including one acute myeloid leukemia patient with an FLT3 mutation that made her a candidate for a targeted therapy, and another whose cholangiocarcinoma was successfully treated with a BRAF-targeted therapy after the mutation—typically associated with melanoma—was spotted. ACC’s role as a national leader in personalized cancer care was also reinforced with the opening of the Center for Rare Cancers and Personalized Therapy in 2015. Directed by Marcia Brose, MD, PhD, this virtual center enrolls patients into clinical trials based on genetic markers rather than tumor origin. Patients with the same mutation, BRAF for instance, but different cancers, are part of the same clinical study investigating a targeted therapy. A story, set to air on TV news affiliates across the country in the upcoming weeks, will feature a patient with a rare salivary tumor who ran out of treatment options, until a HRAS mutation identified through the CPD put him back on track, after switching to the drug tipifarnib. The patient responded well, and a recent scan revealed that his disease has stabilized. Gunther promotes the AACR’s meetings, journals, and initiatives to the media and the public. Walens promotes the AACR’s meetings, journals, and initiatives to the media and the public. She also manages the AACR’s blog, Cancer Research Catalyst. Riley is responsible for media relations promotion and support, conference newsroom logistics, writing and proofreading, website and news release copy, as well as office support for the Communications and Public Relations Department staff. Kite Pharma is joining forces with Alpine Immune Sciences to target the immune synapse, the communications area between the antigen presenting cell and the T lymphocyte (FierceBiotech). Their approach is to specifically modify the T cells in the patient’s peripheral blood so that these T cells will target the patient’s tumour. Their engineered Autologous Cell Therapy (eACT) platform, allows them to modify in vitro the patient’s T cells so that they will express either chimeric antigen receptors (CAR) or T cell receptors (TCR). They have devised single chain antibodies linked to intracellular T-cell activating domains and TCR to specifically target the tumour antigen in the patient. These modifications are introduced into the T-cells via a viral vector to express the CAR and TCR on these cells. The CAR products are specifically engineered to target cell membrane antigens on the tumour cells, whilst the TCR products are able to target both the cell membrane and the intracellular antigens, giving these products a well rounded approach to targeting both solid tumours and haemtalogical malignancies. Kite and Alpine Immune Science’s potential for delivering personalised tumour therapy is now being tested in clinical trials.